The form builder allows institutional administrators the ability to create their own new forms and evaluations or make adjustments and edits to old forms. It is important to understand a few key form builder concepts before you create new forms or make changes to existing forms. All versions of forms will be housed under the “Forms” tab in your institutional administrator account under “Documents”. Each form or evaluation includes basic information at the top of the form that is automatically populated. This information is pulled from the student’s placement. Time2Track encourages you not to ask for these questions again in your actual form or evaluation. The pre-populated information is shown below. To create a new form, click on the “Forms” tab in your institutional administrator account and select the “Documents” sub-tab. This area is where all of the forms and evaluations you create will live. Click “Add a document” and a blank document will open. Give your document a name. Make sure the name used is clear to all users of the form. You may add a description of the form if you’d like. Note that any information added in the description area will not be seen by the recipient of the form. After you've named your form and given it a description, you will need to select the workflow for that form. This will let the system know the order in which the form needs to travel from one person to the next. To select the workflow for your form, click on the arrow in the menu box at the bottom of the screen to display the full menu of workflow options. Then just select the way your form will need to flow. After you've selected the workflow, you will then have the option to select who will need to take action for each section within the form. 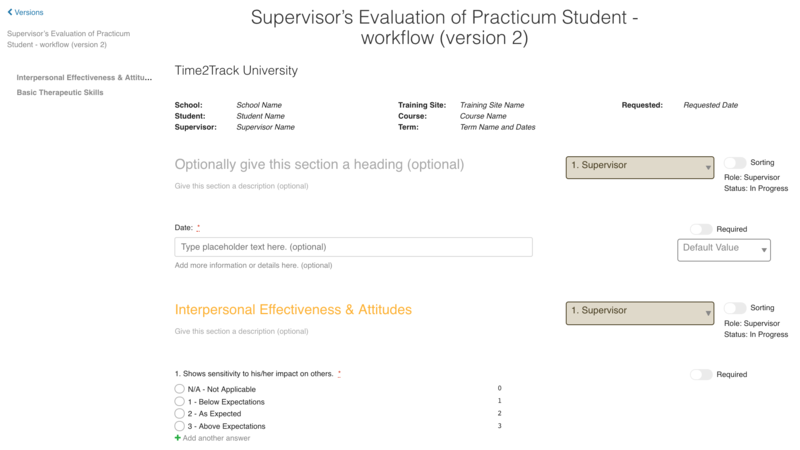 In these screenshots, the workflow shows that the Student will receive the form first and when they've completed their portion of the form, it will then be sent to the Supervisor to complete their section and so on. Each time the form is sent to a recipient that person will receive an email notifying them that there is a form ready to complete by them. The only person within the workflow that will not receive an email notification is the IA (Institutional Administrator). Instead, the Institutional Administrator will be able to access the forms that are ready to be completed from their end by clicking on the "My Forms" sub-tab under the "Forms" tab. To start your form, you will need to add a section. 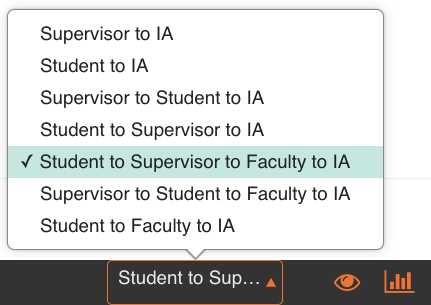 Sections allow you to break up your form or evaluation into different areas and provides the structure to assign those areas to different recipients. To add a section, hover your cursor in the white space directly under the word “supervisor” until you see the "+" appear and click on that icon. When you click the "+" icon an “H” will beappear. Click the “H” to add a section to your form. When a section has been added to the form, you'll need to select which recipient will be responsible for completing information that is in that section. To do this, click on the arrow in the box to the right of the section and select the recipient for that section. As you go through building your form, you will repeat the steps above to add a new section for each recipient. To add questions and/or text responses, hover your cursor just below the previous field and click the "+" sign when it appears. 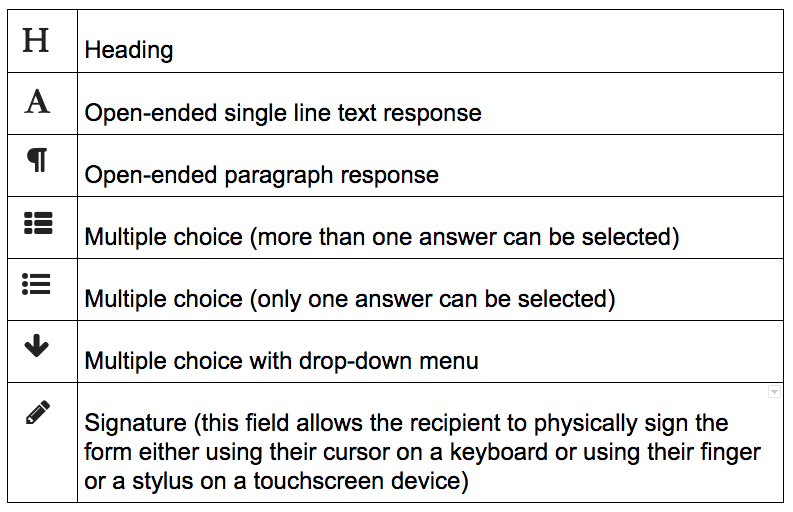 When a multiple choice question is selected, you will have the option to copy the answers from the previous question. This feature will save you time from having to retype the same answers over and over again. However, note that the only way to copy answers from the previous question is if the field directly before the one you're adding has the answers you want to duplicate. Be sure as you add questions to click the "Required" toggle on the right-hand side of the question if the question is required. When the "Required" toggle is enabled that means the field must be filled out before the responder can submit their portion of the form. If you find that a field was added by mistake and you need to delete it, simply click the red trashcan icon to the right of the question and hold for a few seconds. The Time2Track form builder allows you to change the order of your questions and choose the order of your multiple choice responses. To change the order of your questions, click the “sorting” button to the right of the appropriate header. Hover over the left side of the question under a "+" sign appears. Now simply click, drag and drop the questions so they appear in the desired order. To change the order of your multiple choice options, click the “sorting” button to the right of the question. Hover over the left side of the answer you want to move and simply drag and drop the multiple choice options by clicking on the "+" sign that appears to the left of each choice option. Sections (headings) and questions within a section can be sorted by moving the listings in the left-hand column of your form. Hover your cursor over the left side of the list of sections then click on the arrow of the section that needs to be moved. Hold and drag that section to the place you want that it to be. Once all of your information has been entered correctly, you will need to activate your form. 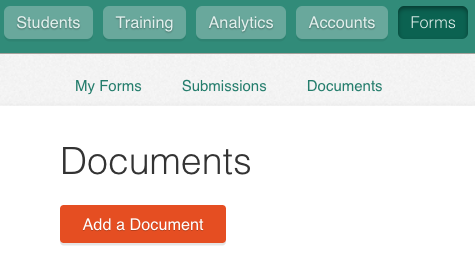 You can activate your form by clicking the orange eye icon at the bottom of the document. 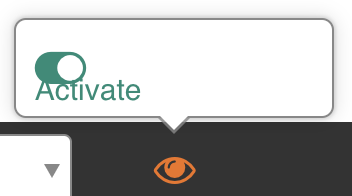 Or by clicking the documents tab, selecting your form and clicking the “activate” button. If you have a form that needs to be deactivated, follow either one of the steps below. Notes: If your form is connected to a course or courses, you'll need to disable the form in all of the courses before you can deactivate it. 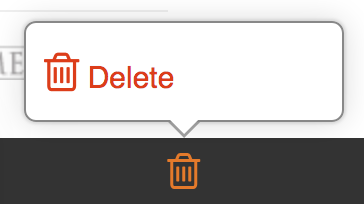 Click the orange eye icon at the bottom of the form that you want to deactivate. Or click on the form on the Documents page and then on the Versions page, click the "active" toggle to deactivate. Open the form that you want to delete and scroll down to the bottom of the screen. Click on the trash bin on the right side of the screen in the black bar. Then click "Delete" in the pop-up box. NOTE: Before you click "DELETE" make sure you want to delete that form because we will not be able to retrieve the form after it's been deleted. To make changes to an existing form, you will create a new version of the form and make changes to the new version. Click on the “documents” tab in your institutional administrator account. Select the form you wish to update. Click the blue “duplicate this form” icon on the far right side of the form name. You will notice the new form will have the same name with (copy) at the end. Update the form name as needed (make sure to reference the version) and make any adjustments or changes needed in the form. To edit your form, scroll to the field that needs editing and make the necessary changes. If you need to add another field, roll your mouse just to the left where you want to add a new question or text response until you see the "+" icon appear and click on that icon. Then select the type of field you want to add. See icons and descriptions for the types of fields that can be added in the second screenshot below. After you've added the field, enter the Question in the fields provided. As you enter information, it will automatically be saved to the new version of your form. When you're finished editing your form, click " Versions" in the upper left corner of the screen to take you back to the Versions screen. When the new version of the form is activated, it will automatically deactivate the old version. Make sure you are ready to use the new version of the form before it is activated. When you have a form in your Time2Track account that is similar to a form that needs to be added to your account, you can use the Create New Document option. Go to your list of Documents and click on the Document that needs to be duplicated. Click on the duplicate icon to the right of the document name and click Create New Document. After you click Create New Document you'll see this message. 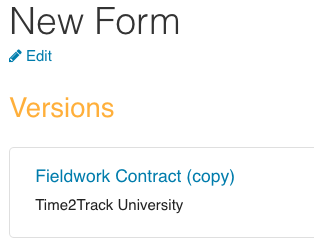 Go back to your list of Documents and you'll see that "Fieldwork Contract (copy)" has been added to the bottom of your list. Click on the document to open it. Once the document is opened, you'll be able to change the name of that copy of the document. To edit the name, click "edit", type the new form name in the box that appears, and click on the checkmark. After you've edited the name of your form, you'll notice that the version name hasn't changed. To change the version name of your form, click on the name to open up the form. When the form is open, you can change the version name and edit any other information within the form. As you edit the form, the changes to your new form are being made in the system.